This article is about the village in Cambridgeshire, England. For the Rupert Brooke poem, see Grantchester (poem). For the necktie knot, see Grantchester knot. For The TV series, see Grantchester (TV series). 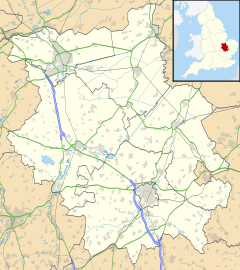 Grantchester is a village and civil parish on the River Cam or Granta in South Cambridgeshire, England. It lies about two miles (3 km) south of Cambridge. The village of Grantchester is listed in the 1086 Domesday Book as Grantesete and Grauntsethe. It is also mentioned briefly in book IV, chapter 19 of Bede's Ecclesiastical History of the English People. John de Grauntsete, a lawyer who had a successful career as a judge in Ireland, was born in Grantchester, c. 1270. The present name derives from the common Old English suffix -ceaster (variously developed as "-cester", "-caster", and -"chester"), used in names of forts or fortified cities throughout England. Grantchester is sometimes identified as the Cair Grauth ("Fort Granta") listed in the History of the Britons among the 28 cities of Britain, but the Roman Duroliponte and subsequent major British and Saxon settlements in the area were at Castle Hill in Cambridge, whose Old English name was Grantabrycge. The confusion arises from the lower stretches of the Granta having been renamed the Cam after the city. Grantchester is said to have the world's highest concentration of Nobel Prize winners, most of these presumably being current or retired academics from the nearby University of Cambridge. Students and tourists often travel from Cambridge by punt to picnic in the meadows or take tea at The Orchard. In 1897, a group of Cambridge students persuaded the owner of Orchard House to serve them tea in its apple orchard, and this became a regular practice. Lodgers at Orchard House included the Edwardian poet Rupert Brooke, who later moved next door to the Old Vicarage. In 1912, while in Berlin, he wrote a poem of homesickness entitled "The Old Vicarage, Grantchester". The house is currently the home of the Cambridge scientist Mary Archer and her husband, Jeffrey Archer. Grantchester has been the home since 1969 of the sculptor Helaine Blumenfeld OBE. The footpath to Cambridge that runs beside Grantchester Meadows is nicknamed the Grantchester Grind. Grantchester Grind is the title of a 1995 comic novel written by Tom Sharpe. Further upstream is Byron's Pool, named after Lord Byron, who is said (by Brooke, at least) to have swum there. The pool is now below a modern weir where the Bourn Brook flows into the River Cam. Byron's Pool is a Local Nature Reserve. Grantchester is the subject of "Grantchester Meadows" (composed and performed by Roger Waters) a song by Pink Floyd, with the village being home to band member David Gilmour. A few years later, David Gilmour also wrote a song about Grantchester Meadows, called Fat Old Sun. The village is also the setting for James Runcie's sleuth novels The Grantchester Mysteries, now adapted as an ITV drama titled Grantchester shown in the UK from autumn 2014 and filmed on location in Grantchester. The oldest parts of the Church of St Mary and St Andrew (Church of England) date from the twelfth century. 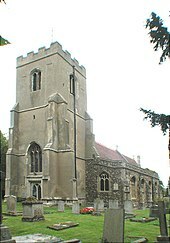 The chancel is mid-fourteenth century and the tower is late-fourteenth or early fifteenth century. The porch is sixteenth century. The nave was extensively restored in 1876–1877. The church is a Grade II* listed building. Sir Robert Yewdall Jennings (1913–2004), President of the International Court of Justice. Sir Desmond Lee (1908–1993), classical scholar, headmaster of Clifton College and Winchester College, President of Hughes Hall, Cambridge. Michael McCrum (1924–2005), Vice-Chancellor of the University of Cambridge, Master of Corpus Christi College, Cambridge, and Headmaster of Tonbridge School and Eton College. Every year on Boxing Day (26 December), Grantchester holds an inter-village barrel race which is around 40 minutes long and ends with a hog roast at the Rupert Brooke pub. This tradition dates back to the 1960s. An underground passage is said to run from the Old Manor house to King's College Chapel two miles away. It was said that a fiddler who offered to follow the passage set off playing his fiddle; the music became fainter and fainter, until it was heard no more and the fiddler was never seen or heard of again. This story is told of many supposed tunnels. On a 17th-century map of Grantchester, one of the fields is called Fiddler's Close. In their 1969 double album Ummagumma, the band Pink Floyd describe the natural beauty of the meadows and River Cam in their song Grantchester Meadows. ^ "Nine things you didn't know about Grantchester". Cambridge News. 13 October 2014. Archived from the original on 13 September 2015. Retrieved 20 December 2015. ^ a b c Kelly, Tony (10 August 1997). "Yes Rupert, there's still honey for tea..." The Independent. Retrieved 20 December 2015. ^ Wright, Karen (9 June 2012). "Helaine Blumenfeld: 'Art is a commitment to risk, a reflection of life – nothing stays the same'". The Independent. Retrieved 20 December 2015. ^ Cambridge: A Cultural and Literary History Martin Garrett - 2004 -- Page viii 1902669797 "Its propensity to flood has threaded through Cambridge from the pubs in Grantchester to the Ditton Plough, a broad green ribbon of flood plain — Grantchester Meadows, The Iammas Land, the Backs, Jesus Green, Midsummer Common, ... "
^ Reynolds, Stanley (6 June 2013). "Tom Sharpe obituary". The Guardian. Retrieved 20 December 2015. ^ Jordison, Sam (9 July 2009). "Going swimming with Roger Deakin". The Guardian. Retrieved 20 December 2015. ^ "Byron's Pool". Local Nature Reserves. Natural England. Retrieved 4 August 2013. ^ "Map of Byron's Pool". Local Nature Reserves. Natural England. Retrieved 4 August 2013. ^ "A Pink Floyd spotter's guide to Cambridge". Cambridge News. 26 August 2013. Archived from the original on 22 December 2015. Retrieved 20 December 2015. ^ Historic England. "Church of St Mary and St Andrew (1309436)". National Heritage List for England. Retrieved 11 May 2018. ^ "Interesting People" (PDF). Grantchester Church. Retrieved 11 May 2018. ^ "Where to go bonkers on Boxing Day". The Guardian. Retrieved 3 November 2014. ^ Ash, Russell (1973). Folklore, Myths and Legends of Britain. Reader's Digest Association Limited. p. 235. ISBN 9780340165973. ^ "Pink Floyd - Grantchester Meadows (Official Music Video)". YouTube. Retrieved 26 March 2019. Wikimedia Commons has media related to Grantchester. Colburn, Ben; Ynys-Mon, Mark. "Grantchester, SS. Andrew & Mary". Cambridgeshire Churches.